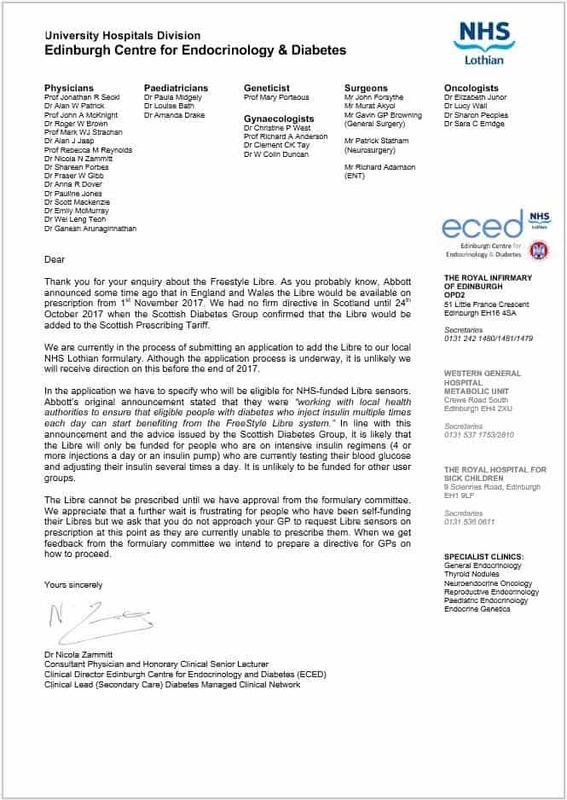 This leaves 4 boards (Highland, Western Isles, Shetland) who may have some patients using the Libre, but do not have a clear policy in place. Borders are doing a 50 person trial at present and intend to extend the trial to include 100 more patients, however at this present time there is no guarantee of commitment after that. It is recommended that flash glucose monitoring with Freestyle Libre® is available for individuals with diabetes who are actively engaged in the management of their diabetes and who intensively manage their condition with multiple daily insulin injections or insulin pump therapy. Satisfy their clinical team that they (or carer) have the required knowledge/skills to self-manage diabetes; for example, having attended a recognised diabetes structured education programme. Clinical review timescales should be agreed to ensure that use of the device continues to support individuals’ diabetes care management. NHS Boards should consider the continuation and discontinuation criteria contained within the Managed Clinical Network (MCN) leads interim position statement (see Annex 1). Recipients should be encouraged to share data with their care team to facilitate clinical review and to contribute to local and national audit. NHSScotland is required to consider the Scottish Health Technologies Group (SHTG) advice. Advice statements outline in as consistent a manner as possible the view of the SHTG on the clinical effectiveness, safety and cost effectiveness evidence for the technology in question in the context of NHSScotland. The status of SHTG Advice Statements for NHSScotland is ‘required to consider’. They are intended to assist NHS planners and decision makers when determining the place of health technologies for local use. Many people have had ongoing funding either through the clinic or special funding requests. We are trying to report on people now being prescribed the FreeStyle Libre since it became available on the drug tariff with factual information unlike the rumours in social media. It is early days, and everything takes time, for this reason, we don’t expect things to become clear until closer to the end of 2017. The good news is no board has given an outright no yet, unlike some CCG’s in England. Unfortunately, we now are hearing noes and long delays in decisions. (TBC) The North of Scotland do not expect a decision until July 2018. If you have any information to add in Scotland, including pharmacy-friendly costs, please contact us, Tweet us, or join us on Facebook. Boards around Scotland will likely base their local guidance on recommendation of the guidance by the Scottish Diabetes Group. See this here. Although Forth Valley, Borders and Lothian are the only boards to commence prescribing pathways (subject to local guidelines) there is talk of a possible National Guidance in Scotland. We will update as soon as more information is available. Northern Ireland has now approved a pathway for the Freestyle Libre for general use throughout the country. Correspondence has been made with all relevant parties with instruction to co-operate with the implementation of the access to the Libre. Once registered they can order sensors which Abbott will deliver in around 24Hrs, so faster than ordering directly from Abbott. As the sensors are not yet on the system, if your GP is writing one, it will need to be handwritten for now. *** Please note, all funding in each board will only be initiated by your specialist clinical team and not GP surgery. March – news coming soon. 19th February 2018 – Prescribing news and guidance expected very soon. November 2017, Prescribing guidance is going through the national process for inclusion in local formulary. Draft guidance is sent to joint formulary for review before a decision will be made. No patients have yet been prescribed the Libre due to the inclusion on the drug tariff. 17th Nov – Borders peads prescribing if they feel it’s necessary. Dumfries and Galloway are using the criteria as agreed from Scottish diabetes group. Please note that Libre sensors can only be prescribed on a GP10 (GP prescription) for patients who have had the monitor issued by the diabetes service. 2. must be >4 years. How does an eligible patient put their details on the waiting list? Patients should contact the diabetes service to be put on the list. What if the recommendation to start a patient on the Flash Blood Glucose Monitoring comes from another Health Board? GP should check with the patient that they meet criteria 1 & 2 and can undertake criteria 3, 4 & 5. GP should then send in a request to the diabetes service to put the patient on the waiting list. GPs must not start a patient on Libre sensors. Flash Glucose monitoring will not suit everyone that is eligible. Diabetes and endocrinology consultant at Dumfries and Galloway Royal Infirmary Dr Fiona Green said: “I think it’s really exciting for those patients who meet the criteria, and it’s something that they’ll really benefit from and will be really excited by. “It’s going to result in better control and better engagement with diabetes. The introduction of the FreeStyle Libre is going through local governance committees with the final recommendation expected in the last quarter of 2018. Result of Scottish Health Technologies Group is that a report will be published on the 13th July, to which all boards should adhere to. January 2018 – Some adults and paediatrics now getting prescriptions. Some are asked to sign a ‘contract.’ Which is committing to meet criteria for continued funding. FreeStyle Libre was added to the Scottish Drug Tariff on 1st November 2017 with a qualification note stating that the product should not be initiated without reference to an appropriate diabetes specialist and in accordance with local guidance. Have attended a recognised diabetes structured education programme and/ or the clinical team are satisfied that the person (or carer) has required knowledge/ skills to self-manage diabetes. NHS Forth Valley will consider the local position regarding FreeStyle Libre in due course, after formally reviewing guidance from NHS National Services Scotland, the full clinical guidance from the Scottish Diabetes Group and any other local factors. The Forth Valley Diabetes Network will review the product to determine the most appropriate place in therapy and which patients this product will be suitable for, taking into account clinical guidance from the Scottish Diabetes Group. The Scottish Diabetes Group guidance indicates that Flash Glucose Monitoring should be considered in people who use intensive insulin therapy (multiple daily injections or continuous subcutaneous insulin infusion). The recommendation to commence FreeStyle Libre should originate from the local diabetes specialist team. Prescribing arrangements will be confirmed once local advice has been issued. In the meantime, patients receiving intensive insulin therapy should contact the specialist diabetes team at Forth Valley Royal Hospital if they have any further questions regarding Freestyle Libre. If you enquire Forth Valley are adding patients who meet the guidelines to a waiting list and advising someone will be in touch. The Larbert Pharmacy are registered to dispense Libre prescriptions and normally have some in stock or can order for you. This pharmacy normally has the Libre in stock ready to dispense, however if you are making a journey over it may be a good idea to call ahead to check. For anyone in the area, this pharmacy comes highly recommended by customers for its helpful staff who will do anything to help and make collecting prescriptions a stress-free task! The FreeStyle Libre® flash glucose monitoring system is a sensor based, factory-calibrated system that measures interstitial fluid glucose levels, rather than blood glucose levels, in people (aged 4 years and over) with Diabetes Mellitus. Whilst the glucose measurement of FreeStyle Libre® is no better than the blood glucose testing systems currently used it allows glucose levels to be measured without finger pricking and provides information regarding the trend in glucose levels that blood glucose testing does not. Evidence to date indicates that this has the potential to encourage patients and their carers to measure glucose levels more frequently and use that information to manage their diabetes better. The Scottish Health Technologies Group (SHTG) published its advice regarding the use of FreeStyle Libre® in Scotland on 13/07/2018. Having reviewed this advice the Grampian Diabetes Managed Clinical Network Devices Subgroup have developed an implementation plan for the use of FreeStyle Libre® in Grampian to ensure that those with the greatest clinical need for this device benefit first. That focussed approach involves providing FreeStyle Libre® to eligible adults with Type 1 diabetes and all children with Type 1 diabetes for whom the product is clinically appropriate. Due to the potential for benefit for FreeStyle Libre® being through encouraging people to more frequently test and better manage their diabetes there is a requirement for all people who will use FreeStyle Libre® to undertake / have undertaken training in both how to manage their diabetes and how to make the best use of their device. The adult diabetes service is planning to provide around 120 training places per month which will be enough for all of the eligible adult patients, known to the service, to have access to FreeStyle Libre® by the end of the financial year. Planning for implementation for children with Type 1 diabetes is being finalised with the aim of providing access to all eligible children as soon as practicable. FreeStyle Libre® comes at a significant cost to NHS Grampian and therefore the Grampian Diabetes Managed Clinical Network Devices Subgroup have developed some very clear criteria for eligibility, continuation and discontinuation and most importantly the patient responsibilities that must be met to be provided with this device. In addition, in order to help pay for the additional costs of FreeStyle Libre®, NHS Grampian and the Diabetes Managed Clinical Network have agreed to work together to implement a number of efficiency projects to offset the costs of FreeStyle Libre®. For details about the criteria that need to be met to receive FreeStyle Libre® and how patients can register their interest to find out more and undertake training please see below. 1) Who will be eligible for FreeStyle Libre® in NHS Grampian? are proficient in carbohydrate counting. FreeStyle Libre® may be appropriate for people with Type 1 Diabetes Mellitus who require someone other than themselves to perform glucose monitoring on their behalf. This may be due to poor dexterity or another disability and make conventional glucose testing and intensive insulin regimens difficult or impossible. c) Optimising glycaemic control using intensive insulin therapy for children with Type 1 Diabetes FreeStyle Libre® is currently licensed for children 4 years or above. Children, young persons and their families will be expected to attend a FreeStyle Libre® training programme before a recommendation to use FreeStyle Libre® is made to their General Practitioner; i.e. no initiation will take place other than through the Diabetes Service. completed appropriate structured education. N.B. insulin pump users will all have undertaken such training. 3) Is FreeStyle Libre® accepted by the DVLA? 4) Who decides if I can get FreeStyle Libre®? Prescriptions for FreeStyle Libre® will only be issued on the recommendation of the secondary care diabetes centre. Once a patient has been assessed as meeting ALL the criteria for initiation, a letter recommending starting FreeStyle Libre® will be sent to the General Practitioner. On initiation patients will receive a FreeStyle Libre® reader and their first sensor from the specialist Diabetes Team. Subsequent sensors will be provided via prescription from the patient’s General Practitioner. 5) How will FreeStyle Libre® use be monitored? 6) Under what circumstances might FreeStyle Libre® be stopped once it has been started? Failure to use testing strips and sensors as recommended. N.B. this includes ongoing excessive use of either blood glucose testing strips or FreeStyle Libre sensors. 7) Once FreeStyle Libre® has been agreed as appropriate for me how do I get it? The reader and first sensor will be provided at the FreeStyle Libre® training sessions and thereafter prescriptions for sensors would be from your General Practitioner (GP). This will be dependent on product availability from the manufacturer. 8) What is my position if I have previously accessed FreeStyle Libre® via private prescription? It is recognised that a number of people with Type 1 diabetes will have initiated FreeStyle Libre® privately (i.e. self funded the cost of the device and sensor). No patient will be transferred to NHS prescription of FreeStyle Libre® unless they meet all of the NHS Grampian criteria for initiation. The same criteria regarding continuation of FreeStyle Libre® will apply to people previously self-funding FreeStyle Libre® as those listed for NHS initiation. 9) If I believe I meet the criteria and am eligible for FreeStyle Libre®, how do I register an interest in attending the Freestyle Libre® education? People with Type 1 Diabetes Mellitus who meet ALL of the eligibility criteria listed below may register their interest by self-referring as detailed below. Please note self-registration of interest in receiving training will only be dealt with via email. Please don’t phone the clinic reception, (insulin) pump administrator, DSN helpline or secretaries. completed appropriate education (for example DAFNE, TIM or DIANE or equivalent level of education). N.B. insulin pump users will all have undertaken such training. People will be asked to demonstrate that they have been monitoring their glucose levels at least 4 times a day to indicate that they are applying the principles of structured education appropriately as part of their consultations with the specialist care team. This will be assessed by reviewing their glucose monitoring downloads for the last 3 months. Those attending clinics at David Anderson Building (ARI), Fraserburgh Hospital or Kincardine Hospital: Please get in touch using email: nhsg.flashmonitoring@nhs.net. You will receive an automated response detailing the next steps for self-referral. This email address should not be used for any other enquiries. Please get in touch using email: nhsg.dghdiabetes@nhs.net. If you are not currently attending the above clinics please discuss with your GP regarding referral to one of the hospital based clinics. Please note your GP will not prescribe FreeStyle Libre® without you seeing the Diabetes Service, being assessed as eligible for FreeStyle Libre® including completion of the required training. If you don’t currently meet the criteria for FreeStyle Libre® we suggest that you discuss flash glucose monitoring and other support available to help improve your diabetes management at your next appointment. Flash Glucose Monitoring (Flash GM) is a new technology that enables people with diabetes to check their glucose levels reducing the need to prick their fingers and draw blood (the traditional way to measure blood glucose). A flash GM device, FreeStyle Libre, came to market last year and was included on the drug tariff on 1st November 2017. Inclusion on the drug tariff provides the mechanism through which community pharmacists and dispensing doctor practices can be paid for the products they supply in response to prescriptions. Inclusion does not indicate acceptance to local formulary or a recommendation for use to local prescribers. 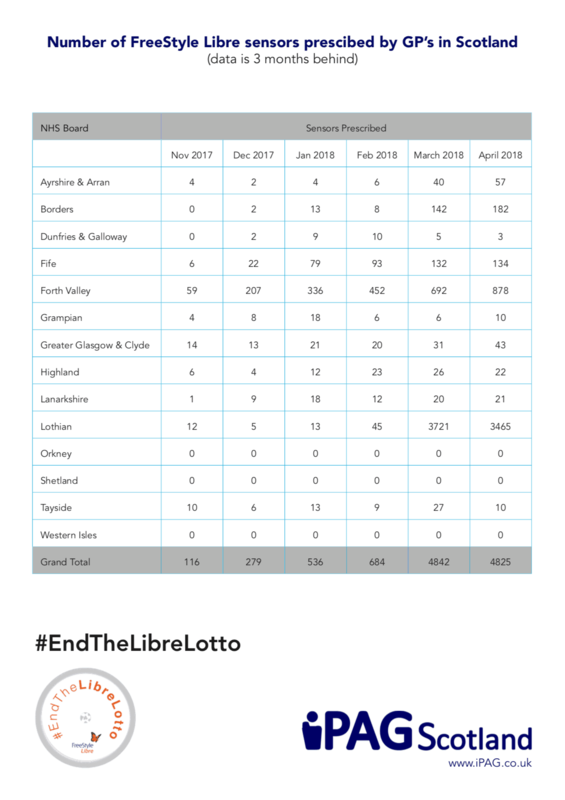 Boards across the North of Scotland have been waiting to see the outcome of the assessment of FreeStyle Libre by the Scottish Health Technologies Group (SHTG), to help inform them on the place of FreeStyle Libre in the treatment of local patients. SHTG has recently published its assessment and advice regarding the use of FreeStyle Libre in Scotland. Boards across the North of Scotland are now considering this advice in order to inform how this device can be implemented to best effect for local patients with diabetes. Boards across the North of Scotland will formalise their plans for introducing FreeStyle Libre over the next sixty days. This timeline allows NHS Boards to ensure that plans for introduction are peer reviewed and is in line with the timelines we adhere to when considering advice regarding medicines. Until that position is developed and agreed, existing approved blood glucose monitoring will continue to be available to meet the clinical needs of diabetic patients. Awaiting result/recommendation of Scottish Health Technologies Group in June. MCN in process of building a business case to be sent for approval. We have been contacted by the Grampian Diabetes Clinic to ask for patient testimonials on the use of Freestyle Libre. If you are interested in contributing your testimonial to the clinic, please contact grampian.type1community@gmail.com and we will send you full details. Please do not send us your testimonial, we’ll tell you where to send it. *** Deadline 4th Dec 2017 for testimonials. June 2018 – prescribing has started to eligible patients flagged up by their team. If we believe you are eligible, you will receive a letter in the next week indicating what to do next. If funding is approved but the criteria are not fulfilled, then it will be withdrawn. Freestyle Libre has been approved for prescription, for people living within NHS Greater Glasgow and Clyde with Type 1 Diabetes who are using multiple daily insulin injections or insulin pump therapy and have been assessed by the specialist clinician to meet one or more of the criteria below. If you feel you meet criteria please have a discussion with your team in the first instance. After the initial discussion with your team, if they find you are eligible for the Libre they will make the referral for you. May 2018 – prescribing to local guidance to start around June. Draft guidelines/criteria from the MCN are being sent to the Health board for approval. Prescribing will be available to those who meet the guidelines and GG&C are keen to keep prescribing consistent for anyone meeting criteria. 15th Nov – More reports of funded patients – However full guidance still not approved. Prescribed on an individual and case-by-case basis. Are selling at a very reasonable cost with a small handling charge. Boots on Great Western Road (Nr Byres Rd) are charging a £20 handling fee and want a private prescription. The Libre is not available for prescription in NHS Highland at present. They are building a business case with a view to making a local formulary submission. No timescale available. The FreeStyle Libre, a flash glucose monitoring device, was added to the Scottish Drug Tariff at the end of 2017. The entry in the tariff stipulates that this device can only be initiated following assessment by an appropriate specialist in the treatment of Diabetes Mellitus and in accordance with local and national guidance. As of May 2018, it has been agreed that NHS Lanarkshire will begin to provide FreeStyle Libre for patients who fall into the 2 categories below. All patients will be assessed to ensure that the device is clinically appropriate option for them. 1. People with Type 1 diabetes who are testing over 8 times per day. 2. People with Type 1 diabetes who have impaired hypo awareness. NHS Lanarkshire Health Board is also aware that the Scottish Health Technology Group (SHTG) is due to publish a review / appraisal on the FreeStyle Libre, which will be published between June and August 2018. This review will include clinical, safety and cost effectiveness evaluation for this device. This report will be a very valuable source of advice on which NHS Lanarkshire will base its final decision on how FreeStyle Libre is prescribed in the longer-term. NHS Lanarkshire is committed to concluding a review of the use of this technology once the SHTG publishes its review. NB Please note that the specialist teams will be commencing small groups of people on the FreeStyle Libre over the coming months. This process will take time and we thank our patients, families and carers for their ongoing patience and understanding during this time. January 2018 – Following a period of discussion across all Scottish Health Boards and Diabetes Services, national guidance and criteria for the use of the Freestyle Libre is in the process of being agreed. It is likely that the guidance will outline clear criteria that patients will be expected to meet before they can access Freestyle Libre sensors on prescription. NHS Lanarkshire intends to adopt the national guidance once it has been finalised, although at this point we do not have a date for when this will be. Freestyle Libre, a flash glucose monitoring device, was added to the Scottish Drug Tariff on 1st November 2017. The entry in the tariff stipulates that initiation of Freestyle Libre should be following assessment by an appropriate specialist in the treatment of diabetes mellitus and in accordance with local guidance. Development of local guidance is underway with NHS Lanarkshire diabetes consultants and this will be evaluated and ratified through the standard Lanarkshire Board processes once complete. Until this process is complete there should be no initiation of prescribing by either Primary or Secondary care clinicians. This is the latest from the Lothian Joint Formulary which appears to state that the Freestyle Libre is now routinely available on prescription from your Specialist Diabetes team. For the most up to date FreeStyle Libre statement please see The Lothian Diabetes website. UPDATE (JANUARY 3rd 2018): The Lothian formulary committee considered the Freestyle Libre at its meeting on 13th December. Although they have provisionally approved its use, there is a lack of clarity over the mechanism for initiating the Libre, which needs to be resolved before it can be prescribed. The committee has therefore been asked to reconsider the position at its next meeting on 24th January. It will not be possible to provide any further detail until after this meeting and the formulary committee may take up to two weeks to inform us of their decision. It will not be possible to prescribe the Freestyle Libre sensors until after the next formulary committee meeting. The #FreestyleLibre is not currently available on prescription in NHS Lothian. A submission will be made to our local formulary committee and a statement will be issued once a decision is made. We cannot confirm any timescale at present. Ian Brown at Colinton Pharmacy in Edinburgh will order and sell sensors for £35 plus £5-£10* fee per order. They have the forms to sign for VAT exemption available. The FreeStyle Libre® flash glucose monitoring system is a sensor based, factory calibrated system that measures interstitial fluid glucose levels, rather than blood glucose levels, in people (aged 4 years and over) with Diabetes Mellitus. The Scottish Health Technologies Group (SHTG) published its advice regarding the use of FreeStyle Libre® in Scotland on 13/07/2018. Having reviewed this advice the Orkney Diabetes Managed Clinical Network Devices Subgroup have developed an implementation plan for the use of FreeStyle Libre® in Orkney to ensure that those with the greatest clinical need for this device benefit first. That focussed approach involves providing FreeStyle Libre® to eligible adults with Type 1 diabetes and all children with Type 1 diabetes for whom the product is clinically appropriate. Due to the potential for benefit for FreeStyle Libre® being through encouraging people to more frequently test and better manage their diabetes there is a requirement for all people who will use FreeStyle Libre® to undertake / have undertaken training in both how to manage their diabetes and how to make the best use of their device. FreeStyle Libre® comes at a significant cost to NHS Orkney and therefore the Orkney Diabetes Managed Clinical Network Devices Subgroup have developed some very clear criteria for eligibility, continuation and discontinuation and most importantly the patient responsibilities that must be met to be provided with this device. NHS Orkney will be following NHS Grampian criteria. 1) Who will be eligible for FreeStyle Libre® in NHS Orkney? b) Supporting people with Type 1 Diabetes who have special needs or require assistance FreeStyle Libre® may be appropriate for people with Type 1 Diabetes Mellitus who require someone other than themselves to perform glucose monitoring on their behalf. This may be due to poor dexterity or another disability and make conventional glucose testing and intensive insulin regimens difficult or impossible. FreeStyle Libre® is currently licensed for children 4 years or above. Children, young persons and their families will be expected to attend a FreeStyle Libre® training programme before a recommendation to use FreeStyle Libre® is made to their General practitioner; i.e. no initiation will take place other than through the Diabetes Service. 2) If I am eligible for FreeStyle Libre® what are the expectations on me before I start using the device and what are my responsibilities once I am using the FreeStyle Libre®? 5. Accept that continued availability of the sensors on prescription will depend on on-going effective use of the technology to improve self management as assessed (6 monthly in adults/ 3 monthly for Paediatrics) by the diabetes specialist team. FreeStyle Libre® is not currently accepted by the DVLA as a measure of blood glucose in relation to driving. Therefore drivers are still required to use (fingertip) blood glucose testing as defined by the DVLA. Prescriptions for FreeStyle Libre® will only be issued on the recommendation of the Diabetes Specialist Team. Once a patient has been assessed as meeting ALL the criteria for initiation, a letter recommending starting FreeStyle Libre® will be sent to the General Practitioner. On initiation patients will receive a FreeStyle Libre® reader and their first sensor from the specialist Diabetes Team. Subsequent sensors will be provided via prescription from the patient’s General Practitioner. The reader and first sensor will be provided at the FreeStyle Libre® training sessions and thereafter prescriptions for sensors would be from your GP. This will be dependent on product availability from the manufacturer. No spares will be kept by the Diabetes Specialist Team. It is recognised that a number of people with type 1 diabetes will have initiated FreeStyle Libre® privately (i.e. self funded the cost of the device and sensor). No patient will be transferred to NHS prescription of FreeStyle Libre® unless they meet all of the NHS Orkney criteria for initiation. The same criteria regarding continuation of FreeStyle Libre® will apply to people previously self-funding FreeStyle Libre® as those listed for NHS initiation. 9) If I believe I meet the criteria and am eligible for FreeStyle Libre®, how do I register I register an interest in attending the Freestyle Libre education? People with Type 1 Diabetes Mellitus who meet ALL of the eligibility criteria listed below may register their interest by self-referring as detailed below. Please note selfregistration of interest in receiving training will only be dealt with via email. Please don’t phone DSN.  Utilise intensive insulin treatment involving multiple daily insulin injections or insulin pump therapy People will be asked to demonstrate that they have been monitoring their glucose levels at least 4 times a day to indicate that they are applying the principles of structured education appropriately as part of their consultations with the specialist care team. This will be assessed by reviewing their glucose monitoring downloads for the last 3 months. If you are not currently attending a clinic with the Diabetes Specialist Nurse please discuss with your GP regarding referral to one of the hospital based clinics. Please note your GP will not prescribe FreeStyle Libre® without you seeing the Diabetes Specialist Team, being assessed as eligible for FreeStyle Libre® including completion of the required training. The clinical team have drafted a planned approach for how they will take this forward with a paper due to be presented to their senior management team before Christmas which will allow them to make a decision and plan for a phased pilot early in January. Tayside guidance – now prescribing! February 2018 – latest update here and unfortunately not what patients were hoping to hear. The decision was not made at the Prescribing Management Group. NHS Tayside is to await the outcome of a Scottish Health Technology Appraisal of FreeStyle Libre to help inform a policy position for its use. This position is likely to be available in mid – late summer 2018. Until that position is developed and agreed Freestyle Libre will not be available on prescription in NHS Tayside. Further information on the availability of Freestyle Libre will be made available at that time. The final decision around the clinical and business case for use in NHS Tayside will be at the Prescribing Management Group in February 2018. We should hear shortly after this. 10th November via a patient – The consultant told me he had ‘good news’ for me. There had been a meeting of the Managed Clinical Network yesterday and the libre would be funded. He said Ninewells are collating names of people at the moment and would be in contact once they knew it was going ahead. He said the GP would need to prescribe but to hold off contacting them yet as they will not have received the go-ahead yet. More news as we get it…. ‘Due to the current lack of published data with regard to clinical and cost effectiveness the North of Scotland Boards are keen to await the outcome of the planned appraisal of FreeStyle Libre. The output of this work should be available in June. North of Scotland Boards will use the outcome of that appraisal to help inform a policy position for the use of Freestyle Libre across NHS Grampian, NHS Orkney, NHS Shetland, NHS Highland, NHS Western Isles and NHS Tayside. This position is likely to be formalised in mid – late summer 2018. Until that position is developed and agreed Flash GM will not be available in the North of Scotland. * Prices correct at time of writing but can change at any time. Availability subject to individual pharmacy quotas.